History buffs have been weirded out that the political culture seems like the 1930s all over again. Well, if you are fed up with that, how about we try the 1830s instead? 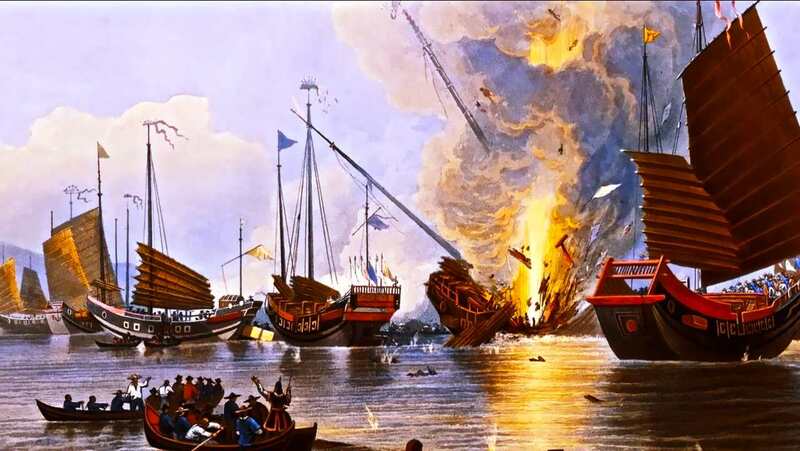 It was a war for opiumLet’s revisit the Opium Wars, as Donald Trump is determined to do. Then, like now, the drug problem – one that roiled world politics and led to massive political upheaval in China – traces to government action in response to some people’s desire to get high. China’s problem with opium began in the late 18th century during a period of territorial expansion and population increases. Trade routes grew and became more profitable with better sailing and shipping technology. Opium began to pour into China from many foreign countries, most notably with the sponsorship of the UK. The Americans got in on the action too. Opium has a harm. Opium is a poison, undermining our good customs and morality. Its use is prohibited by law. Now the commoner, Yang, dares to bring it into the Forbidden City. Indeed, he flouts the law! However, recently the purchasers, eaters, and consumers of opium have become numerous. Deceitful merchants buy and sell it to gain profit. The customs house at the Ch’ung-wen Gate was originally set up to supervise the collection of imports (it had no responsibility with regard to opium smuggling). If we confine our search for opium to the seaports, we fear the search will not be sufficiently thorough. We should also order the general commandant of the police and police-censors at the five gates to prohibit opium and to search for it at all gates. If they capture any violators, they should immediately punish them and should destroy the opium at once. As to Kwangtung [Guangdong] and Fukien [Fujian], the provinces from which opium comes, we order their viceroys, governors, and superintendents of the maritime customs to conduct a thorough search for opium, and cut off its supply. They should in no ways consider this order a dead letter and allow opium to be smuggled out. Guess what? It didn’t work. In fact, the opposite occurred, almost as if the government had inadvertently advertised the glories of opium to the entire population. The more government pushed against the use of opium, the more popular (and therefore profitable) it became. As for the traders, they had not agreed to this silly war on opium, so they pushed ever harder against the ban. When the government began to confiscate and destroy shipments, the British had enough and chose a military option. China not only lost the war of 1840 but another one 16 years later, all because the British were determined to get that drug into the country, much to the gratitude of the addicted population. However, a half-century later, another backlash occurred. Resentful of foreign imposition and the spread of Christianity in particular, a freaky new cult formed called The Righteous and Harmonious Fists, or just Boxers for short. For years, this marauding band of violent reactionaries went around raiding the houses of Christian missionaries and killing them wantonly. This prompted European intervention that led to war after war, further destabilizing imperial rule. A more erudite scholar could draw a line between the losses China suffered in these years and the later rise of fascism and communism in China, all tracing to the fateful decision of 1799 to wage a war on a drug that people liked. The irony is intense, however, because it was the Western powers that were on the side of opium distribution. It was a war for opium. With a new war on opium, certain evils will be incurred. In a similar way today, the current fashion for synthetic derivatives of opium began with prescription drugs, not black markets. It was the pushing of “safe” pharmaceuticals that gave rise to this problem in the first place. You can’t cure the disease by the same means that caused it in the first place. What’s the alternative? None but tolerance, human choice, and the gradual emergence of wisdom embedded in social norms. Nothing will be perfect on the other end. Think of the highest and most well-bred society in history at the height of the Victorian period in England. Anyone steeped in Victorian literature knows well of the opium dens populated by the British aristocracy in the 1880s. The hideous hunger for opium began to gnaw at him. His throat burned and his delicate hands twitched nervously together. He struck at the horse madly with his stick. The driver laughed and whipped up. He laughed in answer, and the man was silent. The way seemed interminable, and the streets like the black web of some sprawling spider. The monotony became unbearable, and as the mist thickened, he felt afraid…. From cell to cell of his brain crept the one thought; and the wild desire to live, most terrible of all man’s appetites, quickened into force each trembling nerve and fibre. Ugliness that had once been hateful to him because it made things real, became dear to him now for that very reason. Ugliness was the one reality. The coarse brawl, the loathsome den, the crude violence of disordered life, the very vileness of thief and outcast, were more vivid, in their intense actuality of impression, than all the gracious shapes of art, the dreamy shadows of song. They were what he needed for forgetfulness. In three days he would be free. “Somewhere about here, sir, ain’t it?” he asked huskily through the trap. Dorian started and peered round. “This will do,” he answered, and having got out hastily and given the driver the extra fare he had promised him, he walked quickly in the direction of the quay. Here and there a lantern gleamed at the stern of some huge merchantman. The light shook and splintered in the puddles. A red glare came from an outward-bound steamer that was coaling. The slimy pavement looked like a wet mackintosh. After a little time he heard steps in the passage and the chain being unhooked. The door opened quietly, and he went in without saying a word to the squat misshapen figure that flattened itself into the shadow as he passed. At the end of the hall hung a tattered green curtain that swayed and shook in the gusty wind which had followed him in from the street. He dragged it aside and entered a long low room which looked as if it had once been a third-rate dancing-saloon. Shrill flaring gas-jets, dulled and distorted in the fly-blown mirrors that faced them, were ranged round the walls. Greasy reflectors of ribbed tin backed them, making quivering disks of light. The floor was covered with ochre-coloured sawdust, trampled here and there into mud, and stained with dark rings of spilled liquor. Some Malays were crouching by a little charcoal stove, playing with bone counters and showing their white teeth as they chattered. In one corner, with his head buried in his arms, a sailor sprawled over a table, and by the tawdrily painted bar that ran across one complete side stood two haggard women, mocking an old man who was brushing the sleeves of his coat with an expression of disgust. “He thinks he’s got red ants on him,” laughed one of them, as Dorian passed by. The man looked at her in terror and began to whimper. At the end of the room there was a little staircase, leading to a darkened chamber. As Dorian hurried up its three rickety steps, the heavy odour of opium met him. He heaved a deep breath, and his nostrils quivered with pleasure. When he entered, a young man with smooth yellow hair, who was bending over a lamp lighting a long thin pipe, looked up at him and nodded in a hesitating manner…. Dorian winced and looked round at the grotesque things that lay in such fantastic postures on the ragged mattresses. The twisted limbs, the gaping mouths, the staring lustreless eyes, fascinated him. He knew in what strange heavens they were suffering, and what dull hells were teaching them the secret of some new joy. They were better off than he was. He was prisoned in thought. Memory, like a horrible malady, was eating his soul away…. Wow, that’s all pretty remarkable, spooky, sad, beautifully terrible, romantic in an awful way, but this turns out to be the way some people are, drowning their sorrows in narcotics, dulling the pain with poppies. So it is and so it always will be. Instead of Victorian England, we could talk about Northern California and its opium scene from the 1890s, which led to the first-ever US immigration crackdown. That’s right: the drug was used in the first race-based population planning in US history. This much we can say: with a new war on opium, certain evils will be incurred.